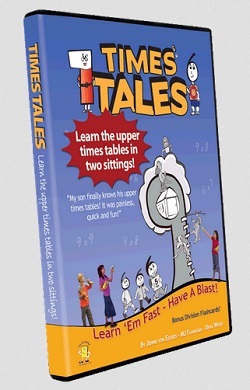 If you have children who struggle learning their times tables, you may want to use Times Tales to supplement your homeschool math program. If fact, this home school math supplement is so great, we’d suggest purchasing it before your child gets to that point! This program teaches the hardest multiplication facts: those with 6s, 7s, 8s, and 9s in them. It is a mnemonic aid to help your child to remember the facts using easy stories. Each of the numbers is associated with a “person” or thing. Then that number becomes part of the story. The story is much easier for children to remember than abstract facts. By learning and memorizing some simple stories, your child will remember even the toughest math facts in a little over an hour. It even works well for children with learning disabilities including dislexia. How Our Own Editor Fell in Love with It! I received this program one afternoon for our oldest daughter and it happened to come in the mail right before we were going to the doctor’s office for an appointment. By the time the appointment was through,my daughter knew her facts AND the doctor who saw us immediately went into her office and ordered one for her son! That is no joke. Before we left the office, she was on the phone ordering it so she would not forget. It works that well!!! She watched it happen. This was one of the top picks of the year! It comes in both a print version and a DVD version and you can buy it either directly from the Times Tales website or purchase it at Amazon.com. Have You Used This Home School Math Supplement?